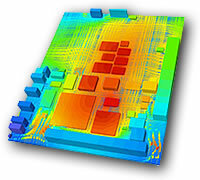 Computational Fluid Dynamics (CFD) software solves 3D Fluid Flow and Heat Transfer (Pressure, Temperature and Velocities). Historically CFD has been a field for specialists, and the perception is still that it is very expensive due to the cost of the software and the human resources to effectively use the software. However, there has been many advances in the usability and effectiveness of the software and more companies are using CFD in the design of their products.